Can You Afford a Sailboat? Sep 8, 2013 by Daniel H.
I have always heard that there are two types of people in the world. There are “boat people” and everyone else. Actually, I think that comparison was meant to insinuate that everyone who does not have a boat wishes they did have a boat. This may be a completely true statement; but is not the subject of debate in this article. Rather, our purpose is in calculating the true expenses related to owning and operating a sailboat. We will accomplish this with a brief oversight of the benefits and drawbacks of sailboat ownership. For those who already own a sailboat, we feel certain you will agree with our findings. Those of you who may be considering this purchase, this article should provide some insight and hopefully help with the decision making process. Generally, boaters are people who like to work hard and play hard. Owning a boat opens up a world of new possibilities. There are numerous watersports, fishing adventures, and lazy days lounging on the dock under the summer sun. Each of these activities requires a different type of sailing vessel. Watersports are best experienced with powerful, high-speed motorboats. Of course, it takes a sturdy ship with plenty of storage and space for the crew to do any serious fishing. The rich and famous lounge around on yachts or houseboats that feature all the amenities of home while taking advantage of the relaxing seafaring life. Sailboats are like adolescent yachts. Even their prices range from a few thousand dollars for a used vessel to several hundred thousand dollars for a professional grade construction sailboat that is designed to sail around the world. The question would be ‘are you trying to get a bargain or sail across the Atlantic Ocean in the dead of winter?’ For most people, it is somewhere in the middle; simply trying to enjoy the fruits of their labor during weekend excursions at a local marina or harbor convention. Sailing is a beautiful way to relax, unwind and take in the scenery. Spending time with loved ones without modern technology distractions is also a bonus. However, it can be a challenge when you consider the other side of that coin. No technology may mean that people get bored quickly, and a change of course could cause the navigator to be lost for several hours. 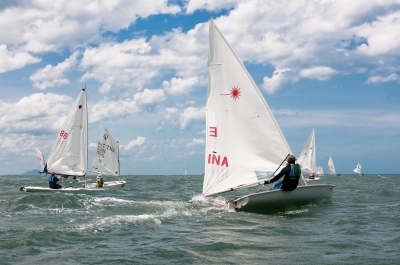 GPS and even smartphone applications can have the sailboat back on course within minutes. The second challenge of owning a sailboat comes in finding a reputable marina, like Lady Island Marina, to store the precious cargo. Boat slips, wharfs and marinas vary greatly from city to city, and the neighborhoods help determine the state of the water and boats housed therein. Finding the right storage solutions may be a bit of a project, and is definitely something that needs to start at the time of or shortly before the purchase is made. Most dealers will be able to provide some insight into the area and are likely to recommend marinas that have excellent facilities and customer care. Previous Post: « Is Renting a Storage Unit a Waste of Money?